Cacidi Chart is a World Class tool for creating all sorts of charts. The Cacidi Charts CC gives a wide range of charts like Pie Charts, Circle Charts, Column Charts, Bar Charts, Stacked Column Charts, Area Charts and the combined Line Scatter Charts. Cacidi Charts CC is an easy to use tool, just select Chart Type, enter data in the grid, press the “Create” button and a super smooth antialiasing chart appears on the selected page. Want to edit the data or the style – select the chart, make the adjustment, all settings are done in real time, want to edit the data, click the cell, make the change and press the “Create” button to update the data. The charts can be puzzled in so many ways, and the adjustments and styling are eminent. Cacidi Charts gives live update of all settings, data as well as appearance can easy be adjusted and all are on-the-fly redrawn. Size adjustment of the charts will auto redraw and e.g. lines in the background will using our custom algorithm be re-calculated. Color styling af the charts can be controlled by creating user determined styles, and a lot of settings like space between columns, lines in the back ground of charts, values can be shown and for Pies, a doughnut hole can be adjusted and some slides of the pie can even be offset from the center. 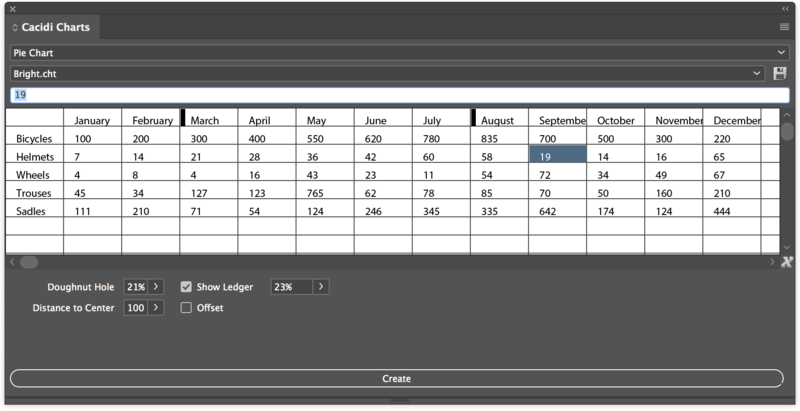 The data in the data grid can be placed as a styled InDesign table with the “Place Grid Data As a Table”. The “Convert Charts to Objects” menu function makes it easy for you to convert the live object format to InDesign elements for safe distributing or creative manipulation. Chose which objects you want to convert by selection them, and if you haven’t selected anything, all charts in your document are converted to standard InDesign elements. You can use converted elements for creative alterring or safe distribution. When converting you chart, the original Cacidi Chart objects are moved to an auto created layer named “Cacidi Charts”, so you always are able to make adjustment on values or appearance, using the original chart.